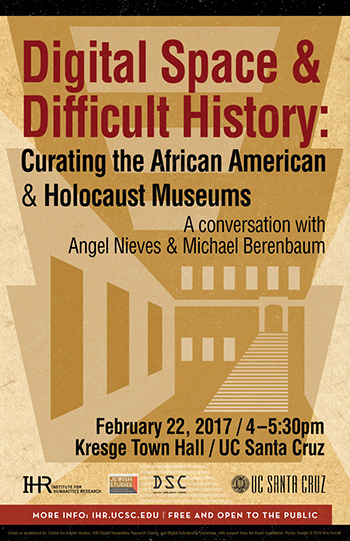 UC Santa Cruz will present a public discussion about building museums, engaging the public, and how to represent difficult memories on Wednesday, February 22, at 4 p.m., in Kresge Town Hall. Michael Berenbaum (project director of the United States Holocaust Memorial Museum) and Angel Nieves (consultant for the “Power of Place” exhibit at the new Smithsonian National Museum of African American History and Culture) will examine the role of museums in today’s world of “alternative” facts, as they explore the potential for digital tools to reimagine how museums speak to their audiences. The new National Museum of African American History & Culture and the U.S. Holocaust Memorial Museum both translate difficult, often traumatic, histories into museum exhibitions. They invite audiences of all ages and backgrounds to contend with diverse narratives of struggle, oppression, violence, and silence. Through the use of digital content, these museums have recently begun to connect with audiences far beyond Washington, and to create new opportunities for understanding, commemoration, and reflection. Sullivan added that Nieves is an active 'digital humanist,' experimenting with new ways of researching and communicating his findings about race and the built environment using digital tools. “He is currently working on a project that includes digital mapping and 3D modeling focused on the South African township of Soweto, that investigates and records how anti-apartheid actions took place within communities of resistance on the ground,” said Sullivan. History professor Nathaniel Deutsch, director of the Center for Jewish Studies at UC Santa Cruz, noted that this event is part of an expanding campus emphasis on digital explorations in the study of Jewish history and culture. “With the support of a three-year grant from the Koret Foundation and the recent addition to the university community of Rachel Deblinger, the director of the Digital Commons and a Ph.D. in modern Jewish history, the Jewish Studies program at UC Santa Cruz is well on the way to distinguishing itself as an international leader in the emerging field of digital Jewish Studies,” said Deutsch. “This important and timely collaborative event represents the latest in a series sponsored by our program—both on campus and off—that has redefined how we study Jewish history and culture, bringing them squarely into the digital age,” he added. This event is co-sponsored by the Center for Jewish Studies, the IHR Digital Humanities Research Cluster, and the Digital Scholarship Commons. Admission is free and open to the public.